VONQ’s Recruitment Technology allows you to easily select the most relevant online media channels for your desired audience, build your job campaign and do the media distribution. The advanced recruitment analytics help you collect, measure and understand your candidate journey: from source to hire. All that to reduce your Cost-Per-Hire (CPH), shorten your Time-To-Hire (TTH) and improve your Quality of Hire. Get the latest updates for free! I’d like to receive occasional updates via email on the latest industry insights, e.g. weekly tips and early access to free content. TURN ACTIVE AND PASSIVE CANDIDATES INTO QUALIFIED APPLICANTS! Recruitment based on candidate data helps you make well-informed decisions. With the help of predictive data you spend your recruitment budget on the most relevant online channels for your desired audience. As a result you get qualified applicants, faster and for less. Try for free now! Sign up now, enter your desired candidate specs and get an instant advice on the best channels to use for free. Draw valuable insights from the advanced Recruitment Analytics, also available for free. 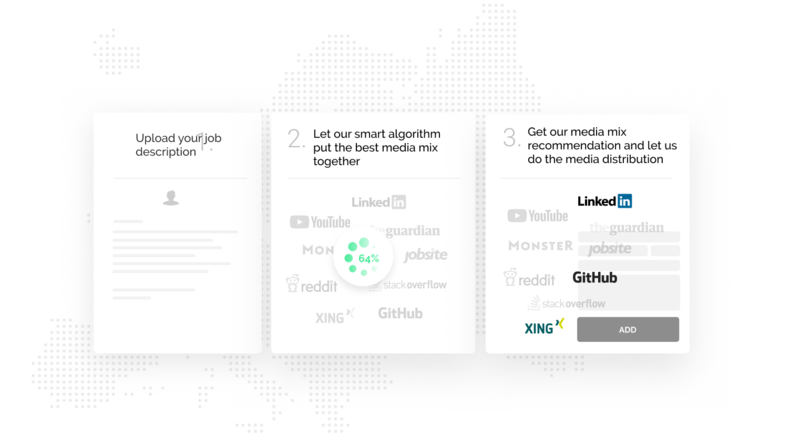 Just upload your job and let our smart algorithm select the best media mix for your target audience. We also do the media distribution.